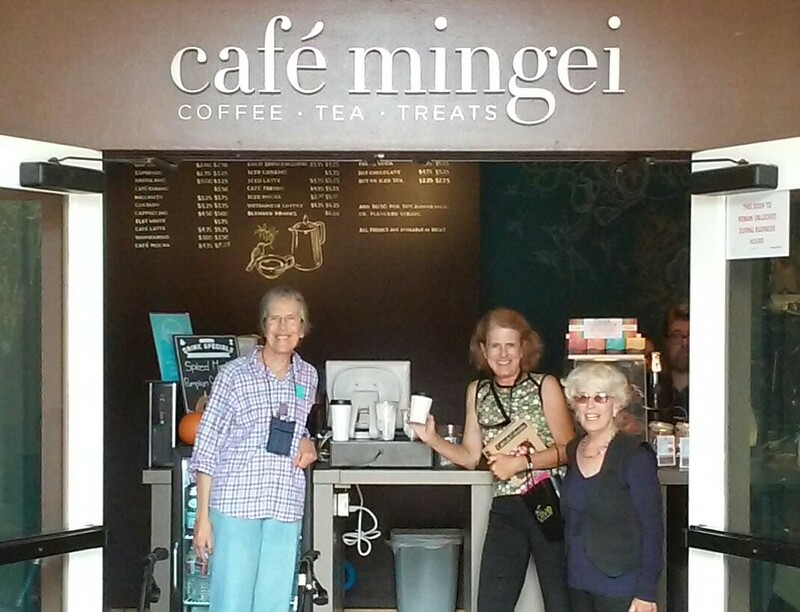 Meet friends for coffee & a visit to the Mingei Museum. The Mingei International Museum in Balboa Park has carved out a small space for coffee & treats just to the left of their entrance. There are tables on the Plaza de Panama to relax & the park has free WIFI. If you have young ones with you they may enjoy climbing on the nearby mythical dragon by Niki de Saint Phalle. Their beans are roasted by The West Bean Coffee Roasters in Grantville (www.thewestbean.com/). I tried something new: a freddo, or as the barista said, “It’s like a martini, it’s shaken.” Well that intrigued me, so with no further description I tried it. A better description would be that it’s a latte with ice, then shaken & the ice removed. It was quite good! So many iced drinks get watered down as the ice melts, but not the freddo as there’s no ice to melt. They also offer a cold press coffee, Cuban coffee & other traditional coffee beverages, plus teas & treats. So what are you doing on the 3rd Tues. of this month? How about coffee and a look at the folk art of the Mingei Museum in Balboa Park? The museum is free to San Diego residents (with proof of county residency) on the 3rd Tues. of every month & the coffee won’t set you back that much. The café is open daily from 8:00am to 5:00pm, although the museum is closed on Mondays. The Mingei International Museum showcases folk art & hand crafted items from cultures around the world, past & present. They have a great gift shop, too. Mingei is Japanese for “art of the people”. For their current exhibit go to www.mingei.org. For a map of the park, go to www.balboapark.org & click “maps” across the top bar. Go early on Tuesdays…parking is free but limited due to the free museums. This entry was posted in Coffee shops in San Diego, cold brewed coffee and tagged Balboa Park. Bookmark the permalink.